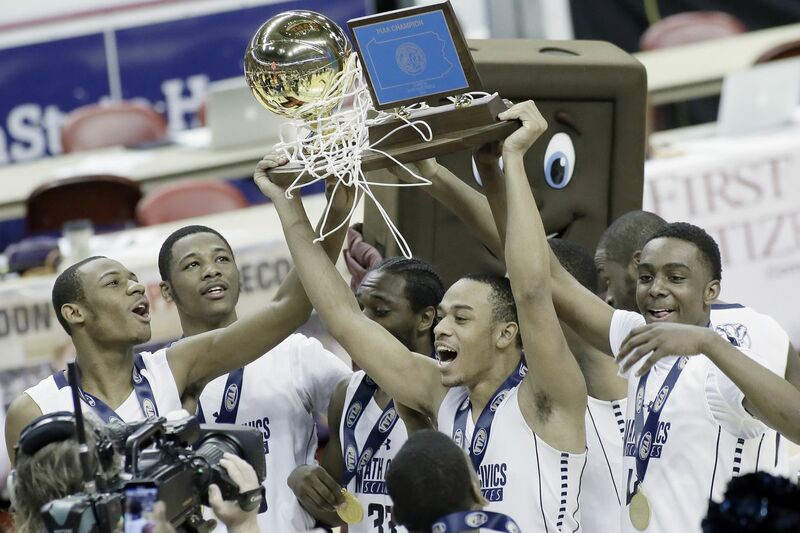 Math, Civics and Sciences players celebrate after winning the PIAA Class 2A boys basketball championship game . HERSHEY -- Bishop Guilfoyle called a timeout with 5.2 seconds left in the state championship game, and coach Chris Drenning drew up a play in anticipation that Math, Civics and Sciences would play man-to-man. The Mighty Elephants played man most of the fourth quarter. But during the timeout, coach Lonnie Diggs told his team to switch to a zone. That proved to be the difference because the Marauders didn’t get a shot off as Math, Civics and Sciences edged Bishop Guilfoyle, 54-52, to win the PIAA Class 2A championship at Hershey’s Giant Center on Friday. It’s the first state championship the Mighty Elephants have won since 2011. “We wanted to mix it up,” Diggs said. “We didn’t want to let them get a chance to key in on what we were doing." After MCS took a 31-25 lead at halftime, they had the lead the entire second half until Luke Ruggery’s three-pointer gave the Marauders a 47-44 lead with 1 minute, 47 seconds left. Jihad Watson took it home from there. The senior guard tied the game at 49 with a three with 1:10 remaining in the game. Then, with 18 seconds left, Watson drove the lane and dished to senior forward Zahir Jackson for an easy lay-in to give MCS a 53-52 lead. On the ensuing Bishop Guilfoyle possession, Watson pulled down a rebound and went 1-for-2 from the line with 5.2 seconds left. Math, Civics and Sciences Jihad Watson splits a couple of defenders. Watson finished with a team-high 17 points, while senior guard Semaj Mills added 14. Bishop Guilfoyle’s Luke Ruggery, a St. Francis (Pa.) recruit, had 17 points but only six in the second half. The plan was to know where the senior guard was at all times. Diggs said that a big part of the triumph was the competition and struggles the players faced earlier in the season. Losses to Coatesville, St. Joseph’s Prep, and Westtown -- each in overtime -- and two defeats to both Imhotep and Constitution were what put his team over the top. MCS: Zahir Jackson 8, Tvon Jones,Semaj Mills 14, Nisine Poplar 12, Jabarr Slaughter 1, Jihad Watson 17. BG: Will Helton 8, Michael Montecalvo 4, Kyle Ruggery 4, Luke Ruggery 17, Jessiah Witherspoon 19. Math, Civics and Sciences players begin the celebration afterthe Math, Civics and Sciences vs, Bishop Guilfoyle H.S. PIAA Class 2A boys basketball championship game at the Giant Center in Hershey, Pa. on March 22, 2019. Math, Civics and Sciences won the contest 54-52.